Utah is a surprising rich destination for spas, and the perfect choice if you love the great outdoors and hiking. Some of the country's finest spas for hiking are located in Utah, including Red Mountain Resort & Spa and Green Valley Spa in the southwest. The landscapes are dramatic. There's lots of federal land to hike on right around St. George, and Zion National Park is just an hour away. 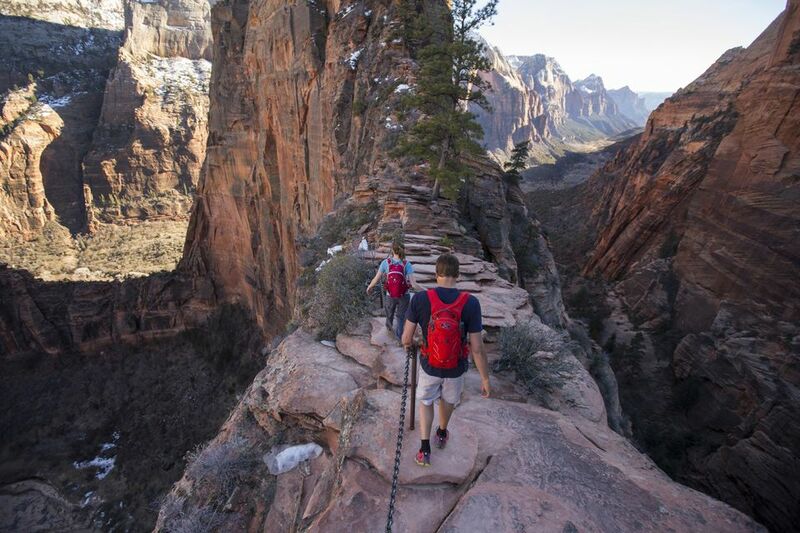 Red Mountain Resort & Spa, which had a strong hiking program and wellness focus, regularly leads excursions to climb Angel's Landing (above). Around Moab in the eastern part of the state is a luxury lodge that makes the most of its surroundings. And if you love to ski, head up north to Park City, Deer Valley and Sundance, where Robert Redford build an environmentally sensitive resort, and started a famous film festival that means, at least ten nights a year, you can't book a room. Red Mountain Resort in St. George, Utah. Right on the edge of both town and public lands, Green Valley Spa is known for its extensive hiking program. Its daily morning hikes regularly consist of excursions to Snow Canyon (pictured above), Padre Canyon, Silver Reef and many other areas within southern Utah's famed red rock country. Green Valley’s hiking program offers two levels of group hiking, or you can hire a private guide to upgrade to more challenging hike guides have deep knowledge of the topography, flora, fauna, and natural history of the area. Green Valley is also famous for its two and three-day tennis camps, and it Red Rock Golf Center offers video/computer analysis to help golfers take their game to the next level. The spa uses its own product line called Good Medicine, derived from wild Mohave Desert medicinal plants, untreated mineral salts, essential oils, and fresh fruits and vegetables, gathered locally and prepared in its on-site lab. It has also expanded its wellness packages to include bioidentical hormone balancing, weight-loss, stress-relief, and reawakening the senses. It's close in price to nearby Red Mountain, but is a little more flexible in its programs and pricing. Your can use it as a destination spa, with all meals and classes (Zumba, Tai Chi, Absolute Abs, Yoga, TRX and many more) included, or you can stay overnight and go a la carte. Contact: 1871 West Canyon View Drive, Tel 800-237-1068. A pocket of modernist luxury on 600 acres near the Four Corners, this ultra-expensive resort is when you really want to get away from it all -- and have the money to make it happen. Meticulously designed to frame their natural settings, Aman destinations are renowned for space and privacy. Every single one of the 30 worldwide Aman resorts has a different ending to the name, but they all start with aman, which means peace, security, safety, shelter, and protection in Sanskrit. The first Aman opened in Puket, Thailand, in 1988, and most are in Asia. There are only two in the United States: Amangiri in Utah and Amangani in Jackson Hole, Wyoming. Amangiri is built in front of a cliff, so that its 34 modern luxury suites blend seamlessly into the landscape. No request is too small, too outlandish -- hot air balloon rides at dawn, horseback riding through the canyons, tours with geologists or archeologists. Experiences range from tours with Navajo guides at slot canyons and Monument Valley to storytelling and ritual dances. Sundance Mountain Resort is the quieter alternative to the big ski resorts of Park City. Set on 5,000 acres at the base of Mt. Timpanagos, the resort is a grouping of picture-perfect cabins set among old growth pines. Robert Redford purchased the property in 1969, and decided to develop it in an environmentally sensitive way. It's really a year-round resort, though demand is highest during ski season. The property has three lifts and a network of trails for cross country skiing and snowshoeing. The Spa at Sundance is inspired by the Sioux concept of Hocoka -- restoring your peaceful inner balance -- and devoted to healing practices that bring the body, mind and spirit into alignment through the healing power of touch. Treatments such as the honey and cornmeal body wrap, the sage and sweetgrass ritual and the native neroli body polish are designed with natural ingredients. Lodging guests enjoy daily complimentary Sundance yoga and meditation classes. The spa itself was built with the environment in mind, including the usage of environmentally responsible building products such as low VOC paint, water saving devices, energy efficient lighting and heating, wallboard made from sunflower seed hulls and the use of Trestlewood lumber salvaged from the Great Salt Lake. One of the special aspect of Sundance Mountain Resort is the Art Studio, where you can spend two hours in workshop on jewelry making, wheel-thrown pottery, watercolor, acrylic or oil painting, printmaking, photography or drawing. All classes are tailored to each individual's ability level from beginner to experienced artists and include expert instruction and materials. All our workshops and classes are open to both resort guests and day visitors. The Arches National Park near Moab, Utah, is one the most beautiful and dramatic places on earth, with 2,000 natural sandstone arches sculpted by the forces of nature. And just a half-hour from the park entrance, right on the Colorado River, is the rustic luxury of Sorrel River Ranch on 160 acres surrounded by untouched, pristine federal lands. All 55 rooms and suites offer views either of the beautiful mountain rust-red sandstone mountain or the Colorado River. Most guests stay here for three to four days and use it as a base to explore Arches and the other nearby national park, Canyonlands. The resort specializes in planning activities, and has its own Adventure Concierge to help you arrange horseback rides, hikes, national park excursions, mountain biking (Moab is famous for this), even hot air balloon rides and skydiving. To calm down, the spa offers six kinds of massage in a very pared down menu. Daily amenities include a yoga class from late spring to autumn, walking meditation and tours of the 1.5 acres of organic garden, which supplies the produce for the River Grill Restaurant. Contact: 877-317-8244 or 435-259-4642. This high-end, American craftsman-style ski-in/ski-out resort is 3.8 miles from the center of Park City, and there is probably no finer spa facility in Utah than the one at Montage Deer Valley. Spa Montage built its reputation in California on excellence in treatment design and therapist training, and brought their same high standards here. Spa Montage’s extensive fitness facilities offer cardiovascular and strength-training options, challenging exercise classes, postural assessment and advanced nutritional guidance. Its light-filled fitness center has state-of-the-art equipment, while an adjoining movement and yoga studio is available for stretching, group classes and individual wellness assessments, training and counseling. The 35,000 square-foot spa has beautifully appointed treatment rooms, an indoor mosaic lap pool with breathtaking views, and his and hers relaxation rooms warmed by the crackling fire. It delivers tranquility in many forms – a rejuvenating treatment, a stress-melting soak in an outdoor hot tub, a Vichy shower, a deep-tissue massage or perhaps Montage’s signature Elements of Wellness retreat, in which a selection of spa services are customized exclusively for you. Heads-up, skiers! Named after Norwegian Olympic Gold Medal skier Stein Eriksen and nestled mid-mountain at Deer Valley Resort, Stein Eriksen Lodge is a European getaway in the heart of Park City. Guests enjoy ski-in/ski-out access, and when they're ready to relax, a 23,000-square foot with over 16 treatment rooms await, including two couple’s treatment rooms with private showers, tubs, and relaxation suite with a fireplace. Separate relaxation rooms for men and women include access to a sauna, steam room, hot and cold plunge. Additional specialty rooms include two Vichy wet treatment rooms, manicure/pedicure stations and separate salon for hair and makeup. There are complimentary fitness class, including yoga, cardio and toning, for guests. 7700 Stein Way, Park City, Utah. Tel. 435-649-3700 or 800-453-1302.